W naszym asortymencie mamy jeszcze więcej urządzeń, np. firmy Kreidler oraz innych, znanych producentów. Mogą Państwo zadzwonić do nas pod numer 223 074 321 lub wysłać nam e-maila na adres info@fitshop.pl. Headset: Chin Haur CH-6201 tapered 1 1/8" - 1.5"
The Kreidler e-bike Vitality Eco 8 Edition NYON (Diamond, 28 inches) is equipped with a high-quality Shimano Deore XT-10 gear shift and hydraulic Magura disk brakes. The BOSCH mid-engine of the Performance Line in the centre of gravity of the bike provides a neutral cycling condition on any ground. Its extremely high traction and its very good efficiency - even at low speeds - conquer any hill or mountain. 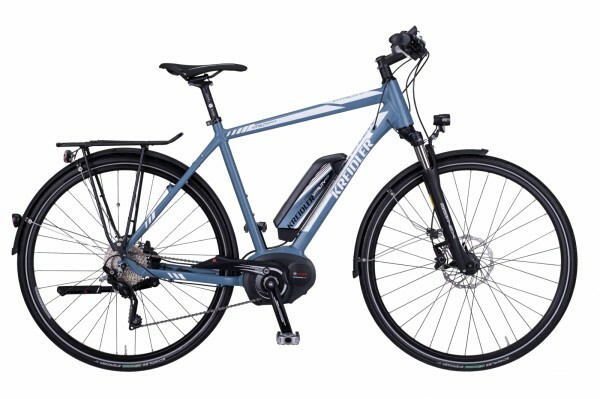 A low weight (23.4 kg) in combination with a high stiffness make the Kreidler e-bike Vitality Eco 8 Edition NYON (Diamond, 28 inches) irresistible. Kreidler integrates the new Bosch Nyon bord computer in the Kreidler e-bike Vitality Eco 8 Edition NYON (Diamond, 28 inches) for the first time. Nyon is the worldwide first bord comptuer for e-bikes, which combines all functions in one device. The wide-range Nyon function supports you from the route planning to the analysis of your performance - before, during, and after your training. The waterproof bord computer is e-bike control, navigation tool, and fitness coach in one. And it develops appropriately with your needs. Because with regular updates, optional additional functions, and a customisable user surface, the Nyon comes as close as possible to your personal needs. With Nyon, you can set individually the motor support in five modes - as required - the calculated remaining distance range considers individually your cycling style. The GPS based Turn-by-Turn navigation gets you to your desired place either in a 2D or 3D illustration. And no matter, wherever you go, you are always available: via Bluetooth connection, Nyon informs you immediately about incoming SMS messages. Uchwyt do smartfonów FINN + aplikacja nawigacyjna (edycja Sport-Tiedje) W magazynie! Kreidler e-bike Vitality Eco 8 Edition NYON (Diamond, 28 inches) Dodaj do listy porównawczej.